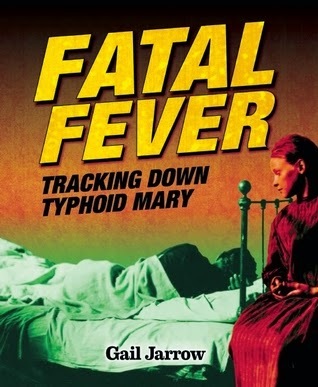 Fatal Fever: Tracking Down Typhoid Mary by Gail Jarrow. Grades 5+ Calkins Creek, March 2015. 192 pages. Reviewed from ARC provided by publisher. Right from the start, this medical history grips the reader and won't let go. This book tracks down typhoid fever outbreaks, explaining how they started and why they were so devastating. Typhoid fever is a serious disease and it caused many deaths, especially of young people. In a time before antibiotics, there was little that doctors could do beyond managing the symptoms of the disease as it ran its course. Gail Jarrow does a great job of presenting Typhoid Mary and explaining why it was so important that she be quarantined while also showing Mary Mallon's side of it. She was an immigrant to this country, distrustful of authority figures that had a history of taking advantage of immigrants, and she didn't understand how she could carry a disease when she had never been sick! This book is not for the faint of heart and may have greater appeal to kids who enjoy a gross-out story. Typhoid fever is transmitted through human waste and, while it's never discussed in a graphic way, there's plenty of poo talk. You may want to choose something different to read over your lunch break, is what I'm saying. I don't mind icky medical details, so it didn't bother me, but I know some are more sensitive to that. My one disappointment is the trim size of the book. I may book talk this to 5th and 6th graders, but the text is pretty solidly middle school and up and I know we'll have trouble getting teens to pick it up. It'd be an easier sell if it was a smaller trim size like an adult book. The narrative moves at a fast pace and archival photos add much to create a sense of place and time. This is an engrossing story for fans of medical history. Deadly by Julie Chibbaro. This fictionalized account of an assistant in the Department of Health and Sanitation artfully portray's the city's side of the hunt for Typhoid Mary. This would be a good choice for teens who like historical fiction. Invincible Microbe: Tuberculosis and the Never-Ending Search for a Cure by Jim Murphy and Alison Bank. This medical history focuses on the search for a cure and does a great job of illuminating the devastating effects of tuberculosis throughout history. Red Madness: How a Medical Mystery Changed What We Eat by Gail Jarrow. This is another book investigating a deadly disease and it's also told in a gripping, fast-paced style, bringing in lots of case studies to bring the era and issue to life. Terrible Typhoid Mary by Susan Campbell Bartoletti. This book comes out in August and I haven't read it yet, but it's definitely one I'm looking forward to. And hey, it's Nonfiction Monday! Make sure you stop by the Nonfiction Monday Blog and check out what great nonfiction books bloggers are sharing this week. To register or to drop in?